We’ve got a fair way to go before we can compete with the likes of Hong Kong’s 130km/h Airport Express train, but from Monday there will at long last be public transport between the national capital’s CBD and its airport (with one stop at Russell offices in between). Canberrans have long wondered why the pro-public transport ACT Government did not offer such a service, and until this week, the concept remained pie in the sky (or pigs might fly, even). There was talk of a rapid transit bus commencing in 2020. The Government painted this talk as a firm commitment, but cynical citizens expressed the view that they’d believe it when they saw it, and with direct international flights servicing our city for six months now, that timeframe bordered on the absurd. The answers provided by the Government and Airport management on the issue were not helpful in clarifying why there must be a further delay of three years. There was talk about needing time to lock-in adequate infrastructure, but this must’ve been in the works for some time, surely. It appears the delay was not to protect the existing shuttle bus operator because by all reports neither the Government nor the airport alerted the company to the impending arrival of ACTION buses on their turf. Was it to allow the privately owned and operated airport a buffer of a few years in which parking fees could help pay for the extensive redevelopment that has taken place there since they bought the precinct in 1998? Given the efficient and visionary nature of the entire project and of the Snow family’s business operations more generally, this too seems unlikely. Their swift issuing of a press statement lauding the decision earlier this week also suggests they’re pleased about the development. “We have been discussing the need for bus services with Transport Canberra for some time, and are pleased the new services to the terminal will start on Monday 20 March,” Airport managing director Stephen Byron said in the statement. “This will provide 64 services each week day, 26 services on a Saturday and 24 on Sundays between the terminal and the city, and we are delighted. Did the delay in provision of a service come down to ACT Government policy? Perhaps our local politicians felt that given it is Canberra Airport and not the ACT Government that benefits from the resounding success of the commercial property development surrounding the airport, it should be up to the operators there to provide transport services for commuters in and out of the precinct. If this was so, the Government failed to recognise the fact that most of these commuters, and many users of the airport, are ACT ratepayers who quite rightly expect that their taxes will go some way to ensuring that our public transport service is adequate. Sure, the bus service is a boon to the operators of the Airport, but the benefits to the Canberra community as a whole far outweigh any negatives around giving the Snow family another leg-up. Whatever the reason, we will wait no more. Transport Minister Meegan Fitzharris revealed during a committee meeting this week that from March 20, Canberrans will be able to use their MyWay card to catch the 11 or 11A bus to and from the airport. Spare a thought, though, for Royale, the operator of the Airport Express shuttle service since 2011. The arrival of Uber at the airport a few months back must’ve impacted on their business, and then learning in the last week via the media of the impending ACTION service only days before it is due to begin must’ve been devastating. For full timetable and route details of the new airport service, see the Transport Canberra website. Putting aside the protestation about the ‘tightwad’ label by a couple of correspondents – I have noticed tightwads usually deny they are one – the arrival of the airport service is a sign that we are serious about welcoming people who are not travelling on a corporate credit card. I recently snapped up some cheap Singapore Airlines tickets and will probably use the bus service to get to the airport. Shame the evening services finish before the return flight arrives. It sounds to me that you are the ‘tightwad’ and you appear to be admitting it by wanting a midnight airport bus service when the new service is only starting next week. I think ACTION will have a few issues to sort out in the first few months of the new airport bus service and they should be given the opportunity to do that. I am sure they will review how the new service is going at some point as well. I think seeking a midnight service now is premature given that there are not incoming late night flights every night of week or even every week night. If there is more than one late night flight each night a late airport bus may be more viable. This should be considered when there is a review. Perhaps it might also be an opportunity for a shuttle van service to operate. Maybe one of the taxi companies or uber (without surge pricing for ‘tightwads’) could offer such a service. Will we ever know the truth about the delay? Even the usual “follow the money” advice does not seem to fit this bungle. 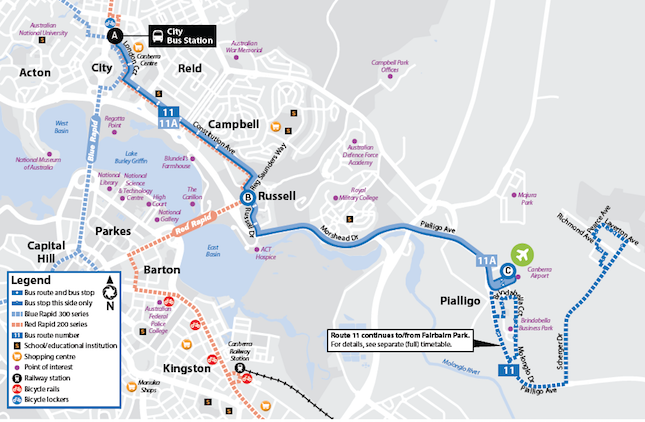 It is one of the great mysteries of Canberra on why there has not been public transport to and from the Canberra Airport terminal. Most cities have airport public transport and have had it for many years now. Some have suggested it has been the airport wanting to protect its taxi and parking revenues. Others have suggested the ACT Government has not wanted to run buses to the airport and some people thought it could be ACTION or the TWU. For some years it does appear that the taxi lobby was quite strong in this town and that they have had a role in pushing against airport public transport. Indeed runs to and from the airport have been a great income stream for them for many years. More recently the ACT Government has said it was the arrangements the airport had with the private van shuttle service which was subsidised by the airport. This service had imitations in that it had a poor timetable and did not provide disabled access for people in wheelchairs. Whatever the reasons we are now getting public transport to and from the airport on 20 March 2017. The ACT Government needs to properly promote this new service and it is important that there is good signage at the airport on the service. Luggage racks will also be essential for the service. The new service will also need the support of locals and visitors and all should be encouraged to use it. I wasn’t part of any organised ‘mission to encourage, cajole or embarrass the Government into introducing a service to the airport’ but did tweet with this purpose more than once. Not because I’m a tightwad traveler, but because it seemed absurd and wasteful for Action to be running a service round the business park adjacent to the airport terminal with stops that seemed to be deliberately located as far as possible from it. Despite this, I’ve been regularly using the existing #11 service to travel to and from the terminal, and I wasn’t the only one. For a while, the drivers would sometimes offer to stop on the corner nearest the terminal to let people off (after warning them to tag off their myway cards at the previous official stop), although this stopped, possibly because the bosses got wind of it. I rang an Action manager a while back during a network consultation period to ask why the buses couldn’t run via the terminal, pointing out that it wouldn’t take any longer if they substituted this for the pointless looping of the business park. He couldn’t offer any reasonable explanation other than to say they were talking with the airport. The government may or may not have already been negotiating or planning a rerouted and upgraded service (though this seems doubtful given that their response to the twitter campaign was to say that a new rapid service to the terminal and business park would begin in 2020). I probably wasn’t the only one to point out that they were planning to build a light rail line in three years, while saying it would take four years to move a bus stop. 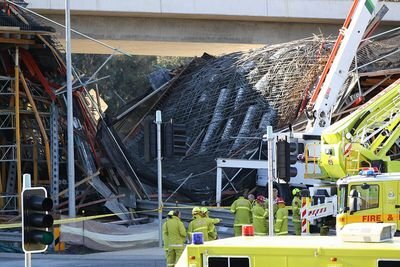 This didn’t inspire confidence in the government’s ability to successfully build and operate a light rail system. Whatever the reason for the sudden turnaround, it’s a positive outcome and a sign that the ACT government can listen. bigred I think has the wrong end of the stick. He may well be a ‘tightwad traveler’ himself but I have really pushed for airport public transport for 12-18 months now and I certainly am not. I do not often use Canberra Airport for private travel but it was very obvious to me that something big was missing from Canberra Airport despite the new flash facilities. So what started as a question became a complaint and then a campaign for public transport to and from the Canberra Airport. Perhaps bigred did not like the Twitter activity which did cross over to mainstream media. But what was the alernative? Wait another decade or two for light rail to be viable for the airport & vicinity? I suggest that bigred needs to be happy that there is an airport bus finally starting next week. We need to concentrate on the positive and it would be good if bigred uses the service too. A few people I know had made it their personal mission to encourage, cajole or embarrass the Government into introducing a service to the airport. They started their campaign when the relevant Minister told them during the election campaign that Government was satisfied with the current arrangements. They have been contacting MLAs and other lobbyists who they thought were supportive, lodging FoI requests that the Government would rather not have seen, contacting media outlets to seek their support and running a twitter graffiti campaign. They embarked on the campaign because they are inveterate tightwad travelers and decided they could save many dollars if they could use their Myway cards to get to the airport. They could also see the impact negative word of mouth would have on potential future visitors to this town. The timing of the announcement – in response to a friendly Dorothy Dixer during Assembly Committee meetings – was also curious. I guess we will never know why there was such a long period of inertia.